Do you still got out on the bank much? What’s your favourite kind of fishing? My favourite kind of fishing is fishing for dinner. Family fishing on my boat to catch a feed. Even work a few pots for crabs. I love the cooking and eating side of fishing now as much as fishing itself. But I also love pike fishing. Just love pike as fish. Don’t eat them. Love the fact that they’re so butch and toothy. Oh, and I do love perch fishing too. Perch I will eat. Although only the odd one. I remember always tuning into Channel 4 to watch Screaming Reels, how did you manage to score the presenters role? I created and formatted the show. Never wanted to present it. I was busy as a script writer on other shows. But we struggled to find a presenter who we liked and could afford and Channel 4 asked me to do it. Compared to other programmes like Tight Lines, Go Fishing, the Matt Hayes programs etc… Screaming Reels was completely different. What are your thoughts on other fishing programs? I’m not a fan of fishing shows per se. I grew up on Jack Hargreaves and John Wilson but actually found fishing shows boring. I like River Monsters. But I don’t watch it very often. And I like the Deadliest Catch – but don’t watch that much. I could see the beauty of a Passion For Angling – but I’ll be honest I’m not a spectator. I want to be out there doing it myself. Why are there so few fishing programs on TV? Surely there is a big enough audience for a regular terrestrial show? Good question. I think the problem is in the culture of TV production and commissioning – there are no anglers who work in high level TV commissioning. Also, angling is too diverse and fragmented – too many different factions. Even with Screaming Reels people complained about it not having enough carp fishing or sea fishing. Angling is not like any other sport it is too multifarious. I recently realised there is a similar format on Charlie Brooker’s Screenwipe to some of the features on Screaming Reels… Do you know if he was a fan of the show? No idea. But I’m a big fan of his. Sat at my desk script writing. I write episode of Holby City and other shows – New Tricks, Hustle, Diamond Geezer. And I help write the story lines for Holby too which requires me travelling to the studios in Elstree. I also write books and features for mags – all of which is at home in front of a computer. In the afternoon I work on my land. Building ponds and bridges and chopping down trees. HFW was a big fan of Screaming Reels and stalked me. 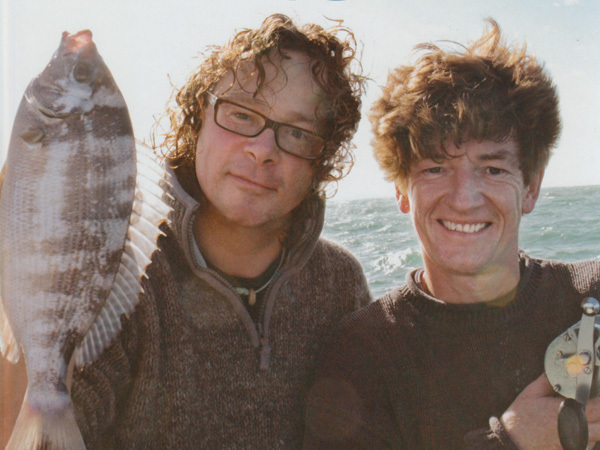 We ended up becoming good mates and have fished and worked together at various times and owned boats together and cooked together. He’s a very very keen angler. Top man really.